This is a real treat for any adventurous children you may have under your roof. There are stairs for them to climb up to a fun decking area, so there is a real sense of adventure available here for them to enjoy. 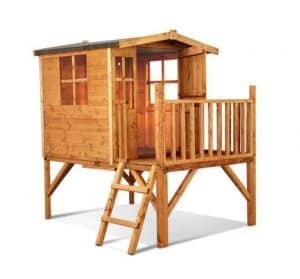 The Bunny Max tower has a heightened roof, so you have a tower that affords more headroom which will allow the kids to get many years of use out of this playhouse. Both the floor and roof are made of a solid sheet material, bringing a high level of durability and protection to the experience. This really is a great looking, fun way for the kids to spend time outdoors. 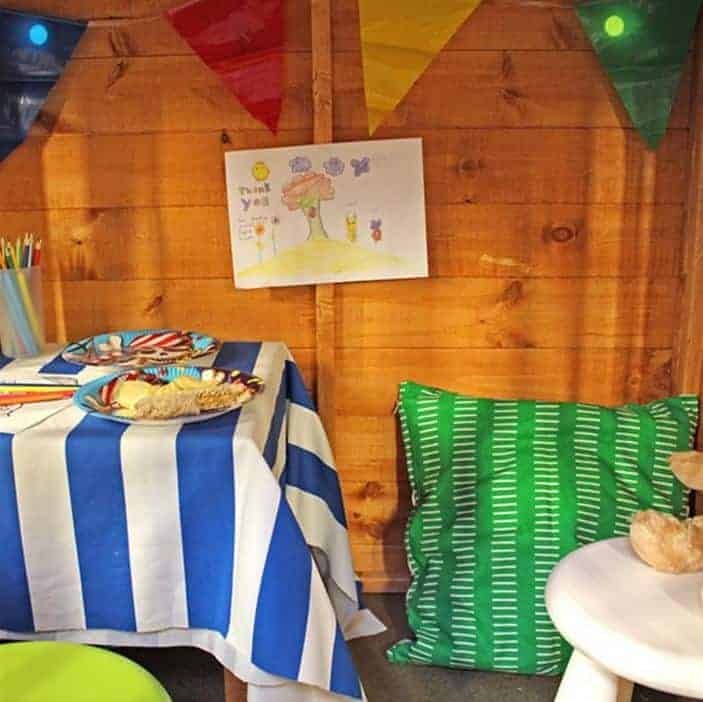 While fun was clearly the driving force behind the design of this playhouse, impressive materials have been used all throughout and done so without making the price high. The walls are made with tongue and groove cladding which not only has a very sleek and smooth look, but it also keeps the rain out and can take some rough play from the kids. The frame inside the playhouse is very well made and is so robust that the structure is going to stay firm for as long as the kids enjoy playing with it. 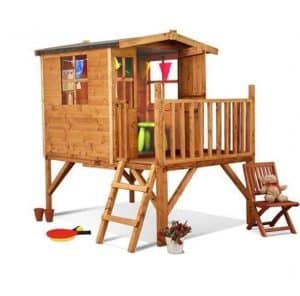 This is a playhouse that from the bottom of the base all the way to the top of the apex roof is high quality. 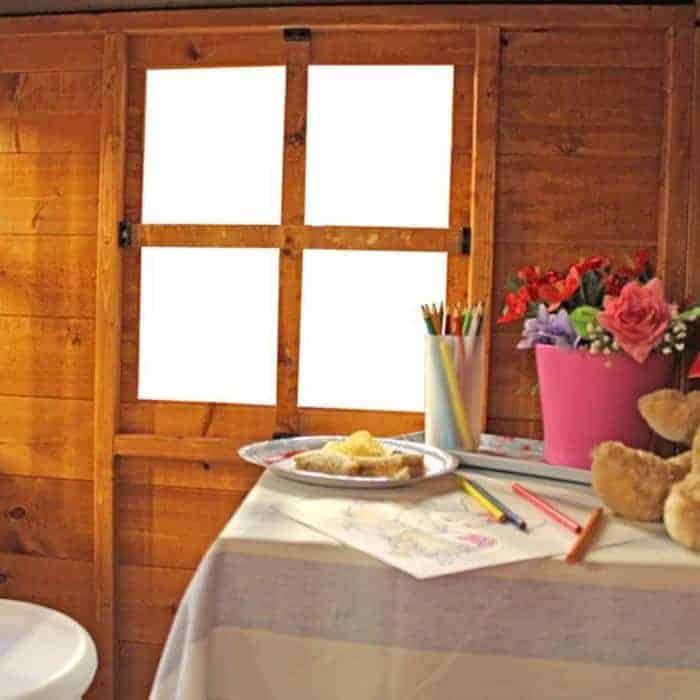 The BillyOh Mad Dash 300 Bunny Tower Playhouse is the perfect playhouse for those of you with children or grandchildren who love to enjoy the outdoors, use their imagination and just have all kinds of fun. This is just such a lovely playhouse that we feel it is pretty much impossible not to be impressed with it. Its tower design makes you notice it right away and that lovely looking, European softwood really does have a smooth look to it. BillyOh do have a few playhouses in this range and this one is the smallest and most basic of the playhouses, but that does not mean it is lacking in the fun department. At 5 foot 1 inch wide and 5 feet 7 inches deep the actual playhouse may not be the largest we have seen, but there is still plenty of room for the kids to have fun. Also in addition to the playhouse there is that lovely decking area that is protected with an adorable veranda. The decking area has a lovely railing and can be accessed thanks to a child safe ladder. The headroom this playhouse offers is very impressive as both the ridge and the eaves height are over 5 feet high. This means the kids will be able to enjoy this for many years even as they grow. We really love the apex roofs that BillyOh use and a matter of fact we cannot think of another manufacturer who makes an apex roof with the same style that these fine folks do. The roof is made with solid sheet material and then covered with sand felt that is in a very nice dark grey colour. 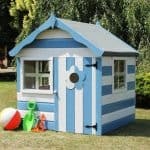 This playhouse has a very smooth look to it and that is because of the incredible cladding they have used for the walls. We feel that using tongue and groove shiplap cladding was not only a smart design choice from a looks point of view, but also because of the longevity and protection from the rain it provides. 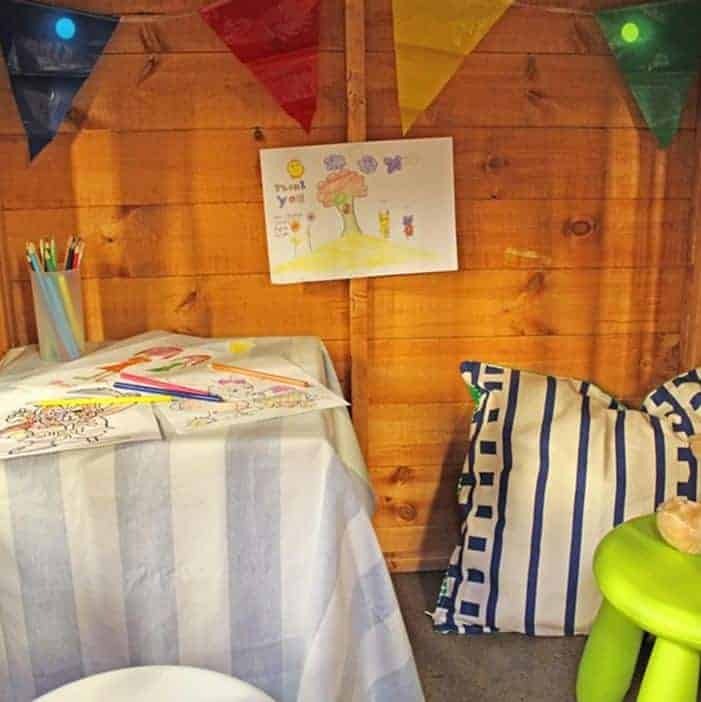 Rather than use the same kind of cladding for the decking area, BillyOh have given this its own adorable picket fence which we are sure you will have to tell the kids time and time again that they are not Superman and that they cannot jump off it. The framing in here is fantastic and is 25 mm x 25 mm, making it able to take a fair bit of abuse over the years. We love how while the framing is solid, it is not going to get in the way of the kids having fun inside. We like a chunky frame from time to time, but it would just get in the way inside of here so we are very happy with this frame. The actual playhouse tower is made with some very thick and strong wood that just helps make this one very impressively sturdy structure. Like the roof, solid sheet material has been used for the floor inside the playhouse. This is something that helps keep the cost low, but it is also more than strong enough for the crazy antics the kids are going to get up to inside. On the decking area, BillyOh have made sure that the flooring is going to be up to the task of dealing with the bombardment of rain it is going to get by making it tongue and groove flooring. Which we might add is not only very strong it also has a lovely look to it. A water based treatment is going to be applied to The BillyOh Mad Dash 300 Bunny Tower Playhouse. But to keep that wood looking lovely, you are going to have to give it a coating of treatment within a couple of weeks of installation. A yearly coating is something we always suggest you do, you do this and we can assure you this playhouse is going to stay rot free. We have gotten used to seeing a standard 2 year guarantee from BillyOh so we were very happy and surprised to see this have a 5 year guarantee. There is a really cool looking stable style door on the playhouse that is kept in its place with strong hinges and securely closes with a magnetic catch, which should prevent the kids from leaving the door open all night. Considering this is a single sized door it is still a very good size and will make getting things in easy for the kids. The height is 3 feet 3 inches and the width 1 foot 1 inch which is a little bigger than we expected it to be if we are honest. 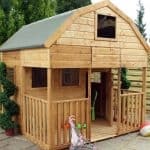 Considering the low price of this playhouse, we were actually very surprised to see there be four fixed windows on here. All four of these are made with high quality, shatterproof styrene and they all are made very well. On the front of the playhouse there is a window on each side of the door, these are narrow windows and we really love the way they look. On each side of the playhouse there is a larger window which along with the two in the front are going to ensure there is plenty of light in the playhouse. Making at least one of these be an opening window would have been great, but at the end of the day we understand this would have raised the overall price. The door on here closes far more securely than some of the other playhouses we have seen and that is something we like. No matter how many times you tell them not to take some of their more expensive things in there like tables, electronic toys and other things that cost Santa a lot of money, they still will. So the door being able to be securely closed is something we are sure you are going to like. 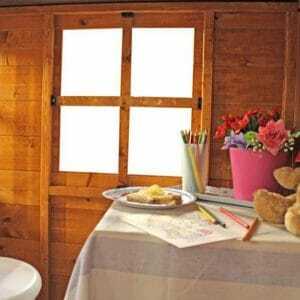 Not a whole lot of privacy is offered by this playhouse because of the generous amount of windows. 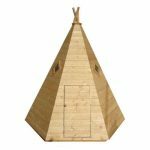 This is great for the adults as it lets you be able to look inside and watch the kids having fun. However if you do want to give the children a little privacy then you could add some curtains to the side or front windows. This will be sent to you unpainted, but you can actually change the look of the playhouse by selecting a colour for the trim and the actual playhouse. They have three different trim colours for you to choose from which are, black, cream and slate grey, these are priced at £7.95 each. As far as paint for the actual structure goes, you can choose from 8 different colours. Red, pale pink, green, cream, turquoise, pink, purple and light blue are what you can choose from and each of these cost £12.95. BillyOh have a couple of extras for you to think about. First of all are these interesting, wooden window shapes that you can add. These are purely decorative, but they will give the playhouse a bit more of a fun look and at £4.95 for a set of two they are fairly priced. They also have a basic DIY kit which they call the BillyOh Value Assembly Kit and this costs £19.95, but if you do have your own tools is really not necessary. 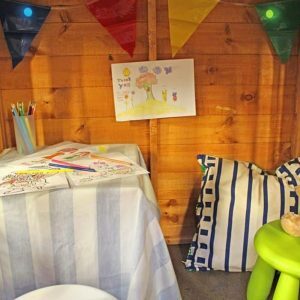 We love how BillyOh are able to make such high quality playhouses at affordable prices. Longevity is the reason that most of these materials were selected so your kids will be able to enjoy this for many years. Also because the ridge height is so high, even as they grow they are going to be able to fit inside here for lots of years. 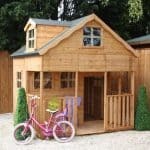 There are much larger playhouses, but we feel this one is a very good size for most kids and they also have the decking area to have some fun on as well. This is pretty high so having a friend to help you is pretty much essential. 4-6 hours is the average time it takes people to put something like this together so it is not too hard of a job. 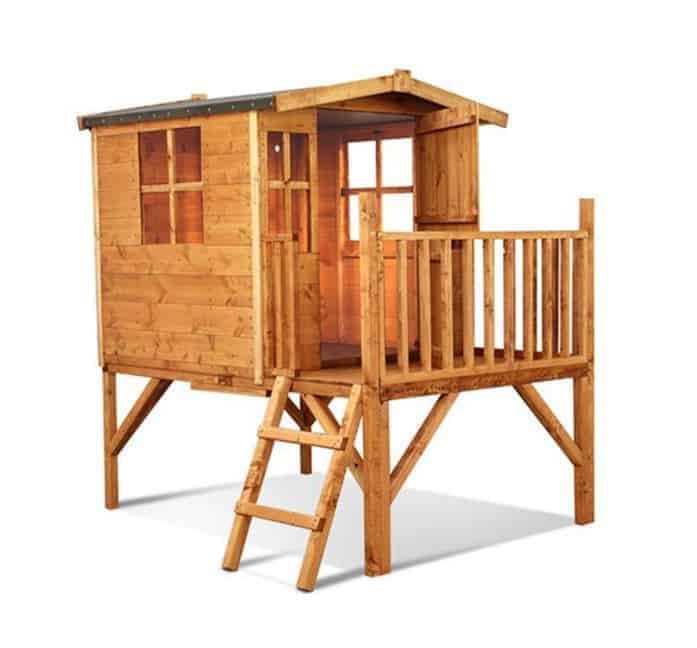 At this price, this playhouse really is incredible value for money. 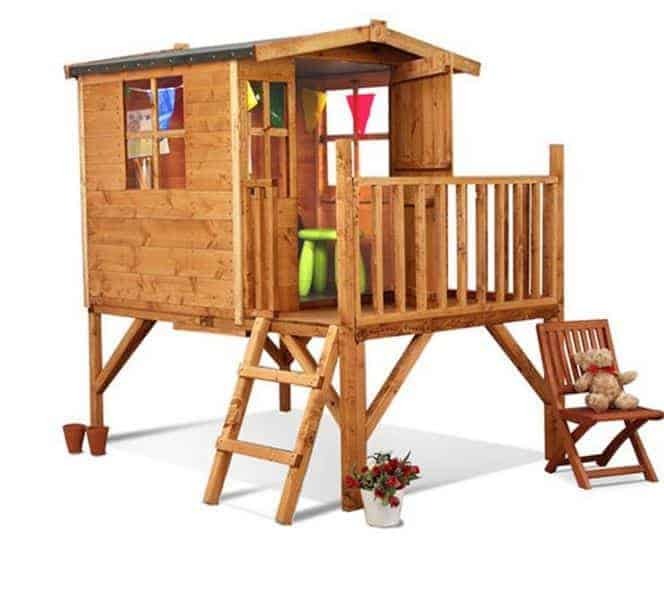 Final Thoughts: Being able to get a playhouse of this size for a fair bit under £200 is something that sounds impossible, but The BillyOh Mad Dash 300 Bunny Tower Playhouse says otherwise. This really is a lot of fun and it is ideal if you want to get your kids a playhouse so they can have fun outside, but do not want to spend a ton of money. This is a great deal and something we can assure you, your kids are going to get many years out of thanks to the impressive materials that are used in construction. 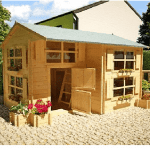 For those of you with a strict budget or even if you just do not want to spend hundreds and hundreds of pounds, this playhouse would be perfect for you.